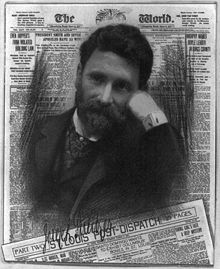 Joseph Pulitzer (April 10, 1847 – October 29, 1911) was a Hungarian-American publisher best known for posthumously establishing the Pulitzer Prizes and (along with William Randolph Hearst) for originating yellow journalism. A perhaps somewhat-fictional version of Joseph Pulitzer is portrayed in the 1992 Disney film musical, Newsies. Our republic and its press will rise or fall together. An able, disinterested, public-spirited press, with trained intelligence to know the right and courage to do it, can preserve that public virtue without which popular government is a sham and a mockery. A cynical, mercenary, demagogic press will produce in time a people as base as itself. The power to mold the future of the Republic will be in the hands of the journalism of future generations. Retirement speech, April 10, 1907, as reported in the St. Louis [Missouri] Post-Dispatch (April 11, 1907).